After five weeks of sleeping outside, waking up at the crack of dawn and going to bed at sundown, retuning to life in Seattle was very weird at first. (I’m sure I’m not the only one who feels that way!). My sleep pattern very quickly reverted to my late-night schedule and one of the first things I did (after dumping all of my camping gear onto my bedroom floor) was sink into my couch and turn on the TV. Home sweet home. While my camping habits fell away very quickly, the lessons and skills I learned while at field school will stay with me for a long time. I learned how to set up and operate a total station, and while I may need a brief refresher on it in the future or may need to follow slightly different procedures on different machine models, I understand the theory behind how the total station works and how it collects data. Our in-depth training and work shopping with the field equipment is something that not all field school students get. I will not need extensive training or to be taught the theory behind how the machine works which I find to be incredibly valuable know-how. During our project I learned to orient the total station in terms of North-South, East-West, take points on an X-Y grid, how to shoot the laser beam from the total station at the prism, and the delicate task of holding the prism level (your ab muscles are the key!). I also got to observe how to interact with communities directly connected to the area in which we were doing research, an experience which I think will have a strong hand in shaping my future professional growth. Almost daily we had members of the community stopping by the schoolhouse site as well as at our camp site; occurrences that made me realize how visible we were to the public and how much our work mattered to everyone. Explaining to people what it was that we were doing helped to keep the public informed and engaged in the work being done as well as reaffirmed my own understanding of the project. The overall response to our field school was very positive, and I am thankful for the support we received from the CTGR community. I encourage anyone who thinks that they may be interested in archaeology to pursue a field school experience. 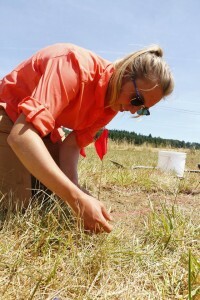 You learn the good as well as the difficult aspects of pursuing archaeological research. You learn how to problem solve when difficulties arise, and you learn which parts of the work you love and which parts you absolutely can’t stand (for me, I don’t want to screen another bucket of dirt for a very long time which is problematic for obvious reasons). A hands-on style is really the best way to learn, and that’s something you can’t get from a textbook. If anyone is looking to pursue a field school in the future, this is definitely one to look out for! During my time here at field school thus far, a big part of the learning experience has been instruction in utilizing technology to aid in fulfilling the project’s goals. Our field equipment includes a Brinno time-lapse camera, a DJ Phantom 3 drone that can take high-resolution photos and videos, a Sokkia CX-105 total station for taking grid coordinates, a ground penetrating radar (GPR), Panasonic ToughPad computers that are portable and easy to transport, Trimble Pro 6H GNSS receivers able to record point locations with sub-centimeter accuracy, and point collection and visualization programs such a Terrasync and Field Genius. These pieces of equipment have proven to be incredibly valuable and even vital to our work in surveying archaeological sites. We can use the GPS receiver and Terrasync to pinpoint an object’s exact location on the globe, or the total station and Field Genius to map out our site grid in terms of location along a North/South and East/West axis. The total station is accurate up to about 3mm, providing a high level of confidence in the location of points along a grid. While these pieces of equipment allow us to keep a very precise digital record of our operations in the field, some of our work still remains paper-based. Stratum and level forms, catalog number checkout, and other key excavation observations are all recorded on paper and stored in a binder. There are opportunities available to digitize this information too, however. Other field schools, such as Doug Wilson’s Ft. Vancouver public archaeology field school, are experimenting with using iPads to digitally record their observations and store their data. With this young generation of new archaeologists having been trained on these technologies and programs, a bothersome problem arises when technology doesn’t work. During one of our survey projects in the Willamette National Forest, in which we were documenting lithic flakes, our GPS receiver repeatedly failed to connect to the ToughPad computer via Bluetooth. A task that should have taken approximately two minutes ended up taking about fifteen to twenty while we shut down and rebooted the program to make the two units reconnect. In such instances we have little choice but to battle with the equipment and, where possible, seek alternative modes of operation such as pinpointing the location of an object or test unit using the old-fashioned compass and tape method from a fixed point. Technology is constantly providing more accurate and more creative ways to collect and express information. We can provide an aerial view of a site location, we can use freely available software such as Google Sketchup to detail a 3-D digital reproduction of what a site might have looked like, and we can use radar to get an idea of what is underground without digging into it. This is just the tip of the iceberg of what we can achieve using technology. Not only are many of these methods detailed, but they also allow us to minimize site destruction and the need for excavation. Technology aids in our accuracy and record-keeping as well as how we approach a site methodologically, and an initial survey using equipment such as the GPR, GPS, and the drone in combination with methods such as pedestrian survey and historical research give us an idea of what is under the surface before we even lay a shovel to it. We have the Student Technology Fund (STF) at the University of Washington as well as the Tribal Historic Preservation Office for the Confederated Tribes of Grand Ronde to thank for much of our equipment.